Monrovia, Liberia - President George Manneh Weah has met in audience the importers of rice and stepped up efforts to ensure the price of the nation’s staple food is substantially reduced and made affordable for ordinary Liberians. 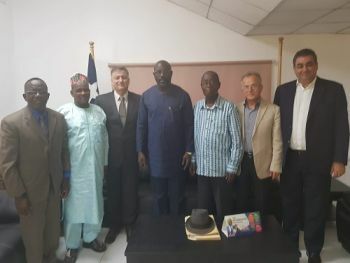 According to an Executive Mansion release, the Liberian leader made the comments when he met with officials of the Association of Rice Importers today in the presence of Commerce and Industry Minister Designate Prof. Wilson Tarpeh. The Liberian Chief Executive said his government was fully prepared to work with rice importers in every way possible to reduce the price of rice, which is also referred to as a political commodity. “If government-imposed tax is an issue, you can rest assure that my government is more than ready to grant reasonable adjustments in the tax regime to make the reduction of rice price possible,” the President said. The President averred that the reduction of the prices of essential commodities is inextricably integral to his administration’s pro-poor governance agenda. Speaking earlier, the rice importers told President Weah that they were willing to dialogue with government to ensure that the price of rice is reduced.